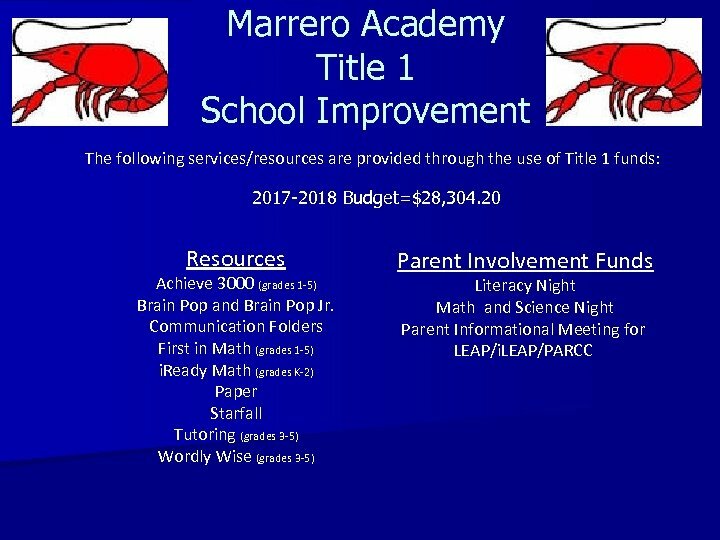 Uniforms n n n n Long or short sleeved purple shirt with Marrero Academy logo (required by JPPSS) Shirts MUST be tucked in. Uniform khaki pants or shorts. (walking length, no pleats) NO CARGO STYLE PANTS OR SHORTS MAY BE WORN. NO CAPRI LENGTH PANTS MAY BE WORN. Girls may wear khaki skirts. NO KHAKI JUMPERS MAY BE WORN. Navy or khaki shorts MUST be worn under skirts for P. E. Solid white socks ONLY – no other colors should be visible on the socks. Girls may wear white tights (not leggings) in colder weather. Solid black, solid white, or black and white velcro (preferred) or laced tennis shoes. NO OTHER COLORS MAY BE VISIBLE ON THE SHOE OR SHOE LACES. NO Mary Jane style shoes or slip-on shoes may be worn. Students MUST wear belts (Black, Brown or Khaki). All Grades (PK-5) All outerwear MUST be navy in color AND bear the school logo. ONLY white t-shirts may be worn under uniforms. ONLY SHORT SLEEVED T-SHIRTS MAY BE WORN UNDER SHORT SLEEVED POLO SHIRTS. LONG SLEEVED T-SHIRTS MAY BE WORN UNDER LONG SLEEVED POLO SHIRTS. Students will be expected to wear their school uniforms, be well groomed, and keep themselves neat while at school. Shirts must be tucked into the pants at all times. No oversized pants or cargo pants will be allowed. Pants must be worn at the waist, not the lower hips. Tennis shoes must be properly laced or fastened. Students will be required to wear picture identification at all times. IDs will be issued at the beginning of the school year and must be replaced if lost. 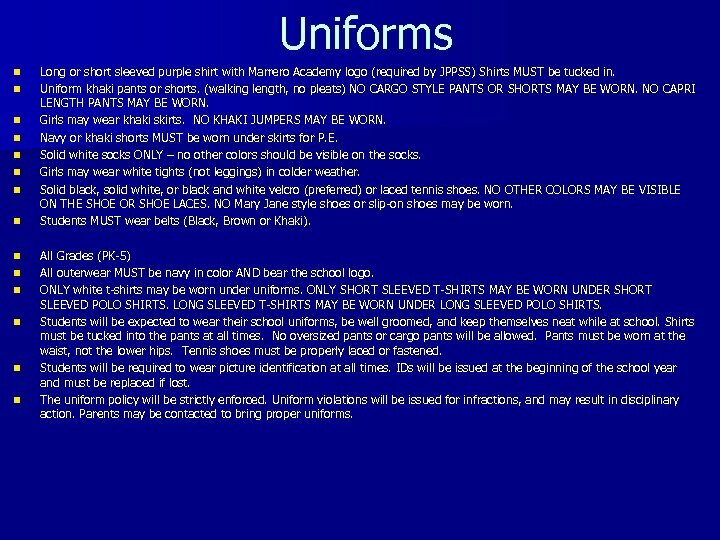 The uniform policy will be strictly enforced. Uniform violations will be issued for infractions, and may result in disciplinary action. Parents may be contacted to bring proper uniforms. 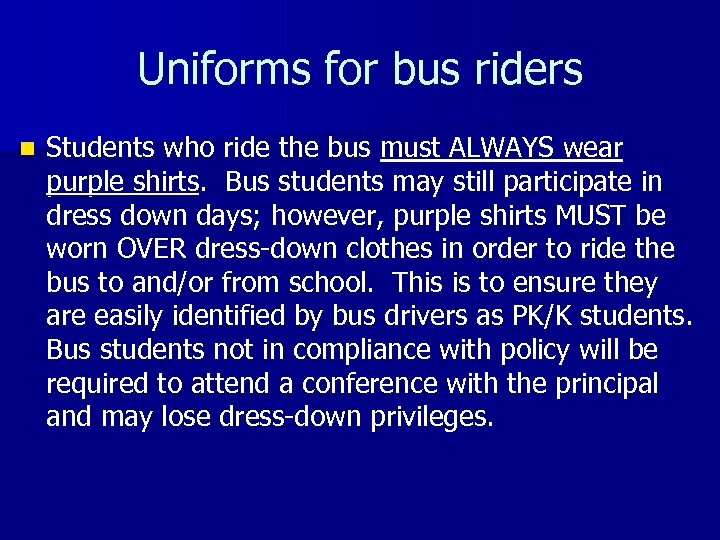 Uniforms for bus riders n Students who ride the bus must ALWAYS wear purple shirts. Bus students may still participate in dress down days; however, purple shirts MUST be worn OVER dress-down clothes in order to ride the bus to and/or from school. This is to ensure they are easily identified by bus drivers as PK/K students. Bus students not in compliance with policy will be required to attend a conference with the principal and may lose dress-down privileges. Daily Folders n n n Blue folder~Sent home daily. 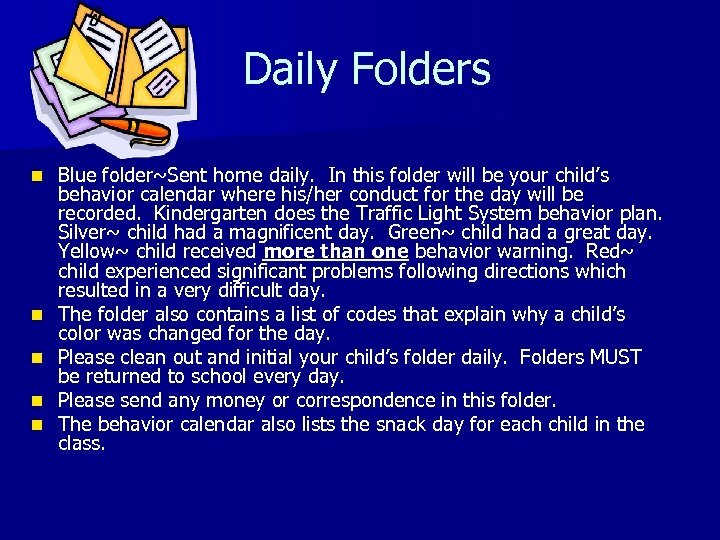 In this folder will be your child’s behavior calendar where his/her conduct for the day will be recorded. Kindergarten does the Traffic Light System behavior plan. Silver~ child had a magnificent day. Green~ child had a great day. Yellow~ child received more than one behavior warning. Red~ child experienced significant problems following directions which resulted in a very difficult day. 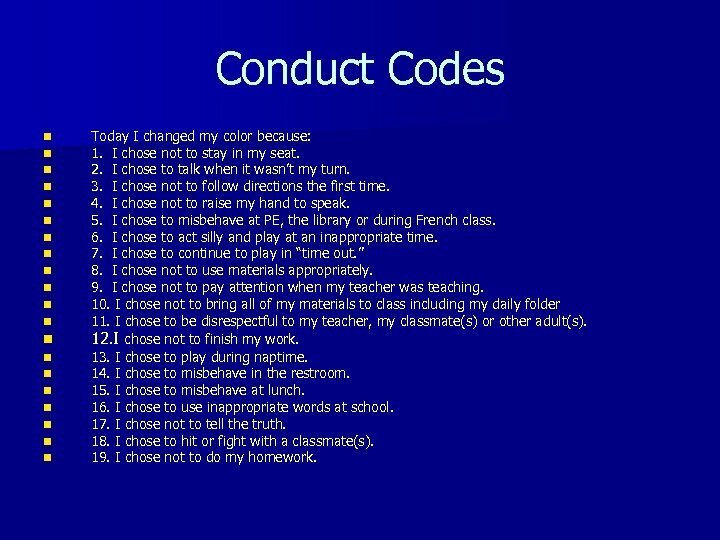 The folder also contains a list of codes that explain why a child’s color was changed for the day. 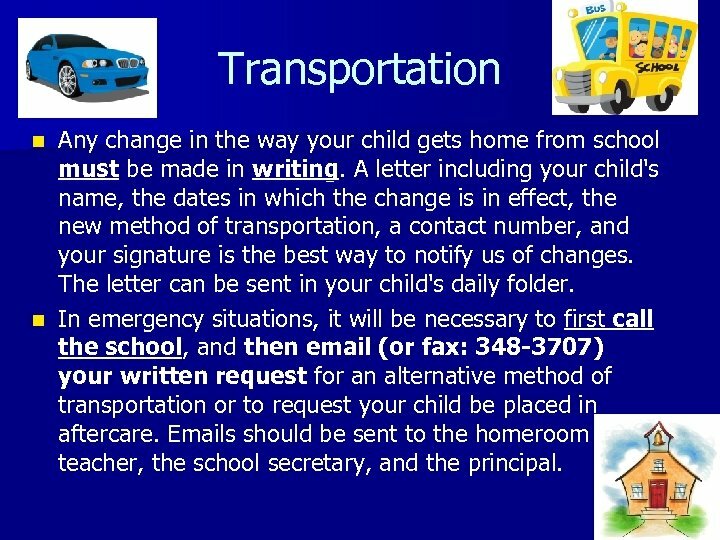 Please clean out and initial your child’s folder daily. Folders MUST be returned to school every day. Please send any money or correspondence in this folder. The behavior calendar also lists the snack day for each child in the class. Conduct Codes n n n n n Today I changed my color because: 1. I chose not to stay in my seat. 2. I chose to talk when it wasn’t my turn. 3. I chose not to follow directions the first time. 4. I chose not to raise my hand to speak. 5. I chose to misbehave at PE, the library or during French class. 6. I chose to act silly and play at an inappropriate time. 7. I chose to continue to play in “time out. ” 8. I chose not to use materials appropriately. 9. I chose not to pay attention when my teacher was teaching. 10. I chose not to bring all of my materials to class including my daily folder 11. I chose to be disrespectful to my teacher, my classmate(s) or other adult(s). 12. I chose not to finish my work. 13. I chose to play during naptime. 14. I chose to misbehave in the restroom. 15. I chose to misbehave at lunch. 16. I chose to use inappropriate words at school. 17. I chose not to tell the truth. 18. I chose to hit or fight with a classmate(s). 19. I chose not to do my homework. Snack n n n Kindergarten uses a rotation system for snack. Each child is assigned a designated day to bring snacks for the whole class. 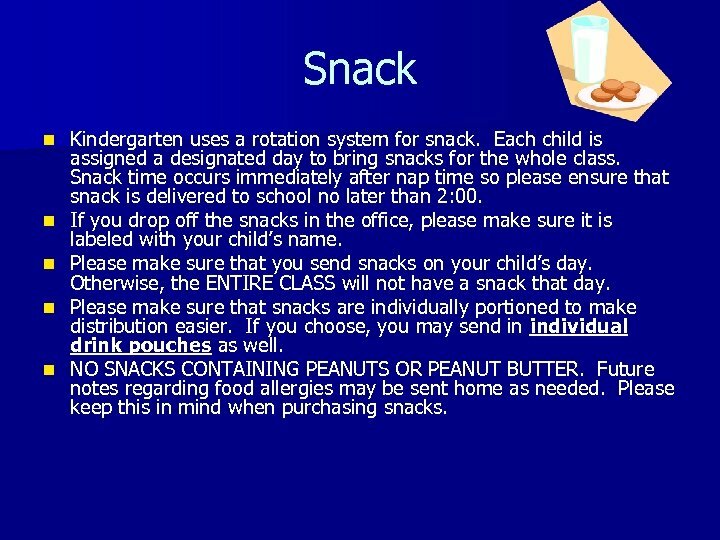 Snack time occurs immediately after nap time so please ensure that snack is delivered to school no later than 2: 00. If you drop off the snacks in the office, please make sure it is labeled with your child’s name. Please make sure that you send snacks on your child’s day. Otherwise, the ENTIRE CLASS will not have a snack that day. Please make sure that snacks are individually portioned to make distribution easier. If you choose, you may send in individual drink pouches as well. NO SNACKS CONTAINING PEANUTS OR PEANUT BUTTER. Future notes regarding food allergies may be sent home as needed. Please keep this in mind when purchasing snacks. 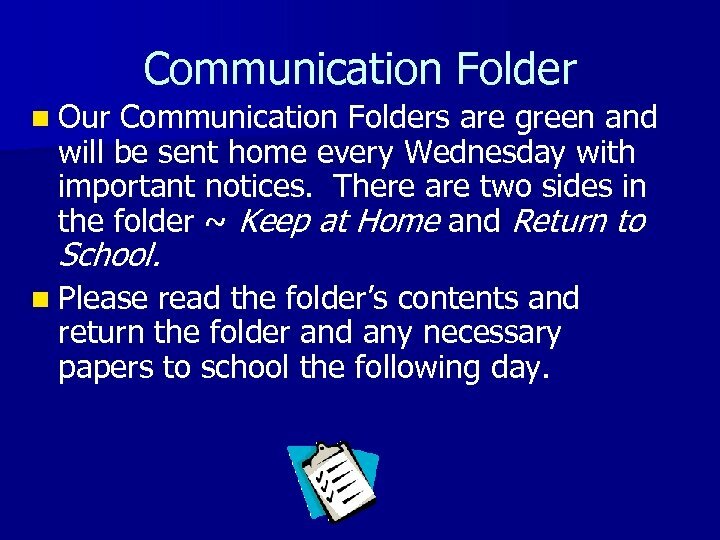 Communication Folder n Our Communication Folders are green and will be sent home every Wednesday with important notices. There are two sides in the folder ~ Keep at Home and Return to School. n Please read the folder’s contents and return the folder and any necessary papers to school the following day. 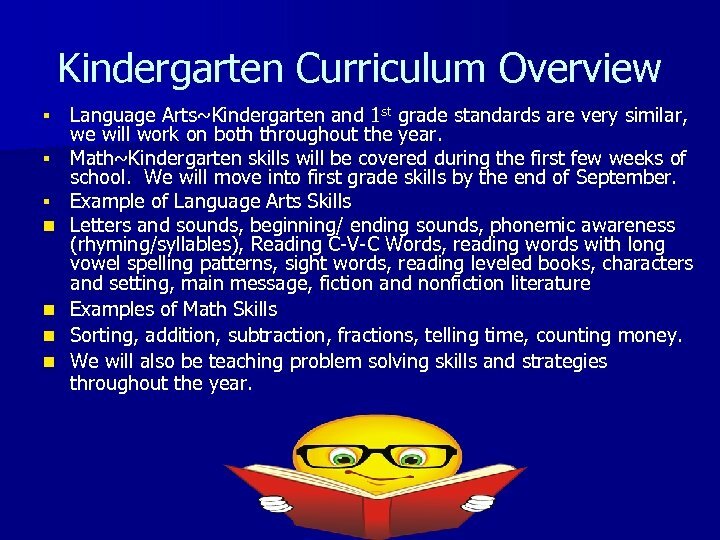 Kindergarten Curriculum Overview § § § n n Language Arts~Kindergarten and 1 st grade standards are very similar, we will work on both throughout the year. Math~Kindergarten skills will be covered during the first few weeks of school. We will move into first grade skills by the end of September. Example of Language Arts Skills Letters and sounds, beginning/ ending sounds, phonemic awareness (rhyming/syllables), Reading C-V-C Words, reading words with long vowel spelling patterns, sight words, reading leveled books, characters and setting, main message, fiction and nonfiction literature Examples of Math Skills Sorting, addition, subtraction, fractions, telling time, counting money. We will also be teaching problem solving skills and strategies throughout the year. 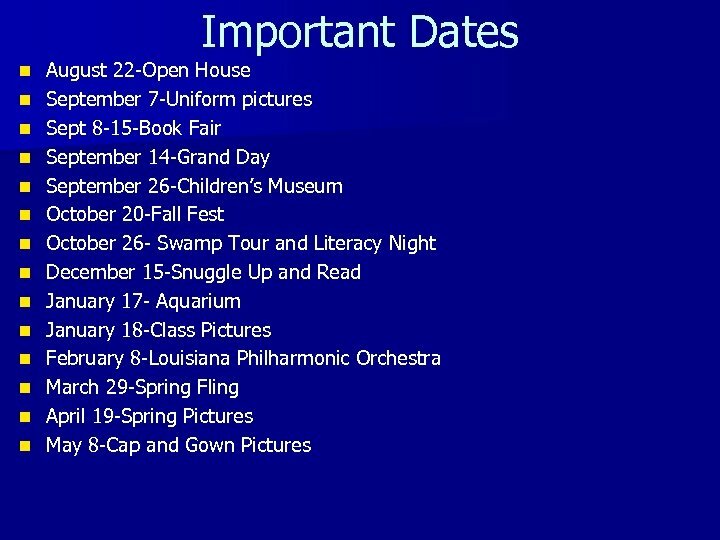 Field Trips n n n n n Students must be in full school uniform (spirit shirts). Students may NOT dress down on field trip days. Students must arrive at school in their normal manner (child care, carpool line, bus). Students may not enter through the front office unless they are tardy. All students must have their ID to attend the field trip. As per school policy, no child will be allowed to call home for an ID or purchase a new ID on the day of a field trip. Chaperones must check in through the office when arriving and must leave through the office. If chaperoning please plan to arrive after carpool has ended and park on the side of the school. Please do not park in the teacher parking lot before 8: 20 a. m. Chaperones may not park in the front of the school (in front of the office). We ask that all chaperones ride the bus with us to the field trip. 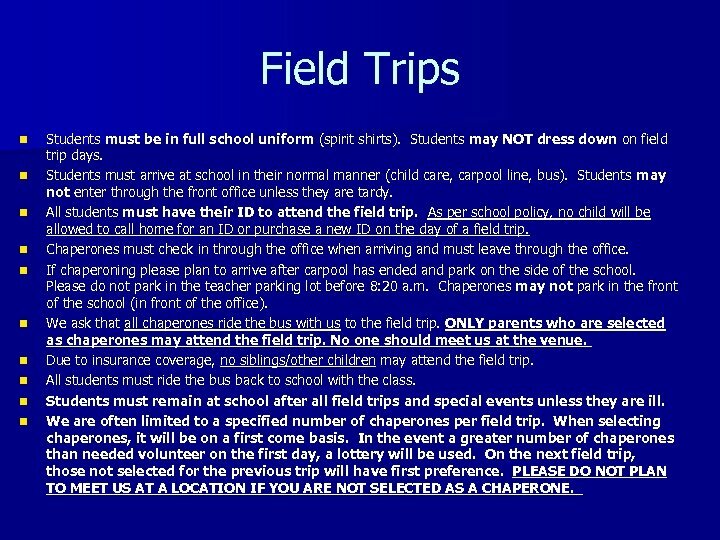 ONLY parents who are selected as chaperones may attend the field trip. No one should meet us at the venue. Due to insurance coverage, no siblings/other children may attend the field trip. All students must ride the bus back to school with the class. Students must remain at school after all field trips and special events unless they are ill. We are often limited to a specified number of chaperones per field trip. When selecting chaperones, it will be on a first come basis. In the event a greater number of chaperones than needed volunteer on the first day, a lottery will be used. On the next field trip, those not selected for the previous trip will have first preference. PLEASE DO NOT PLAN TO MEET US AT A LOCATION IF YOU ARE NOT SELECTED AS A CHAPERONE. Library n n Students are taken to the library once a week. Kindergarten students will be able to check out library books beginning in October. 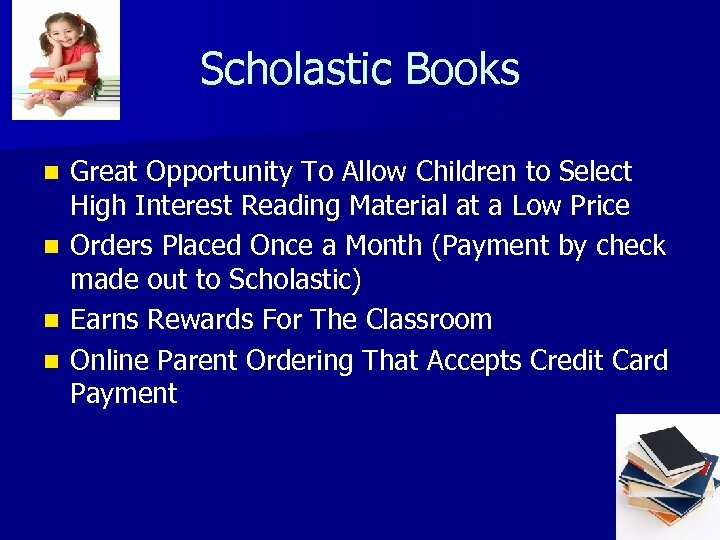 Parents must give permission for their child to check out books. Permission slips will be sent home. 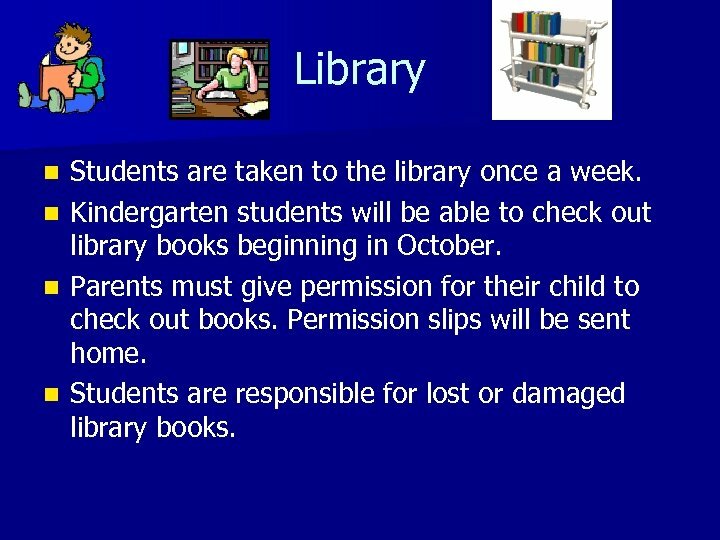 Students are responsible for lost or damaged library books. 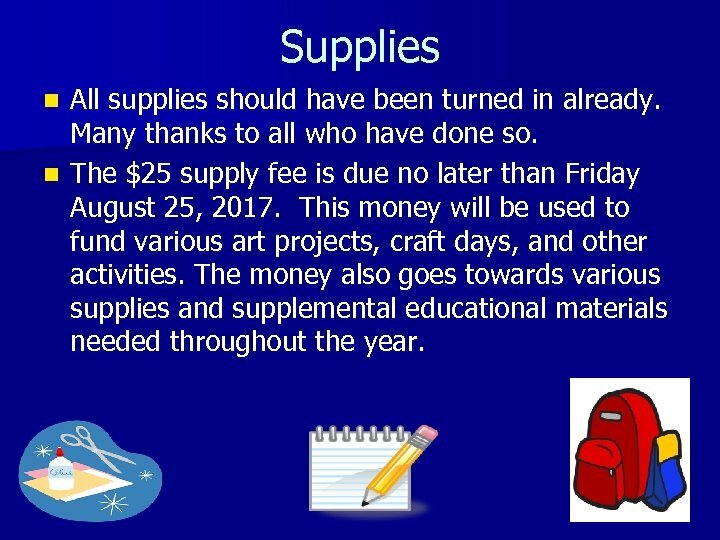 Sending in Money n Please send all money in a sealed envelope labeled with your child’s name, the amount enclosed, and the purpose for sending the money. 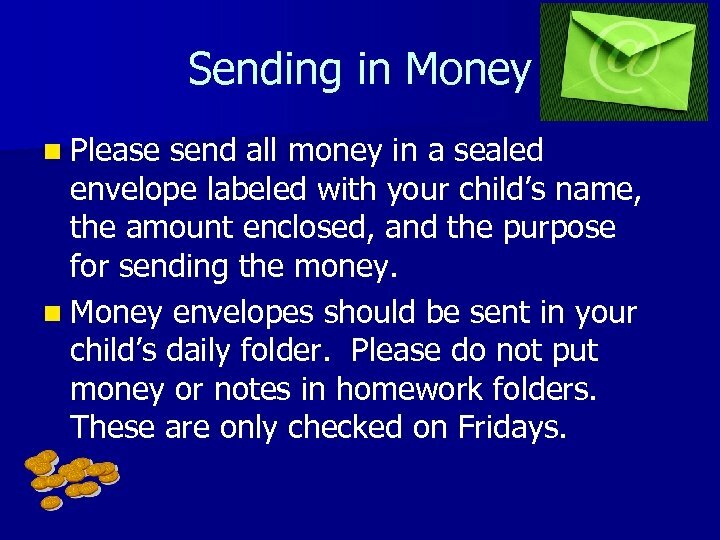 n Money envelopes should be sent in your child’s daily folder. 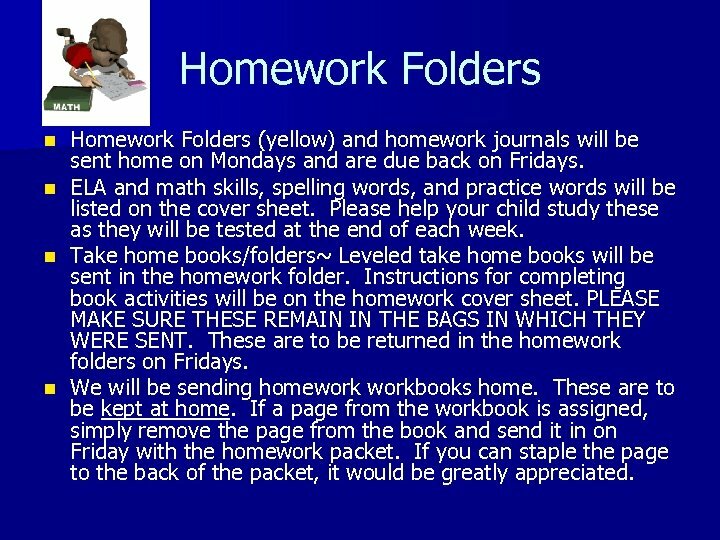 Please do not put money or notes in homework folders. These are only checked on Fridays. 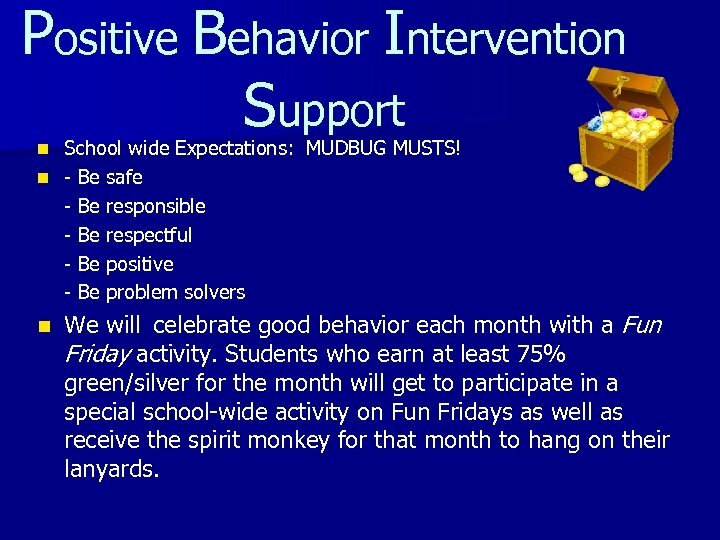 Positive Behavior Intervention Support School wide Expectations: MUDBUG MUSTS! n - Be safe - Be responsible - Be respectful - Be positive - Be problem solvers n n We will celebrate good behavior each month with a Fun Friday activity. 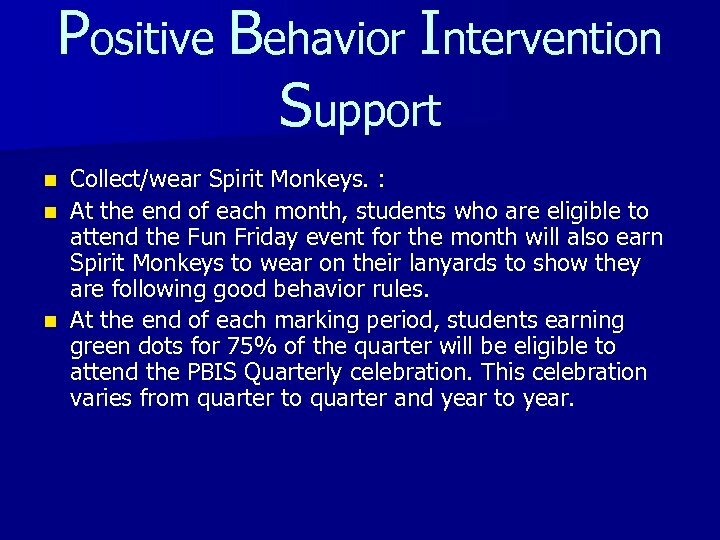 Students who earn at least 75% green/silver for the month will get to participate in a special school-wide activity on Fun Fridays as well as receive the spirit monkey for that month to hang on their lanyards. 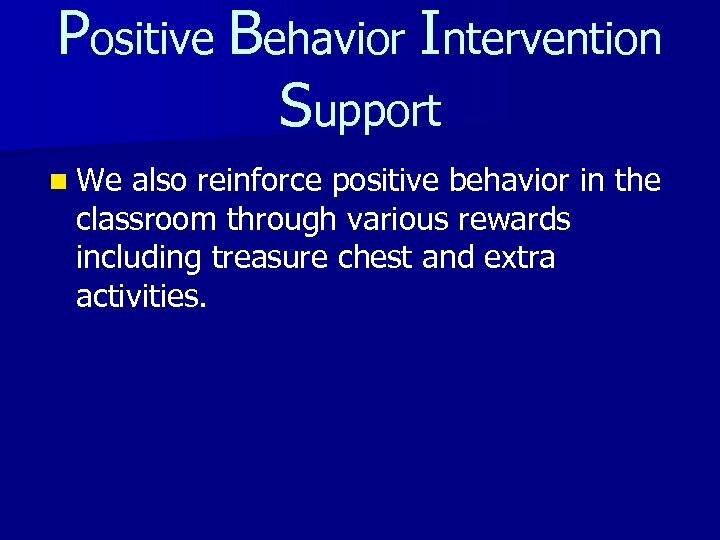 Positive Behavior Intervention Support n We also reinforce positive behavior in the classroom through various rewards including treasure chest and extra activities. 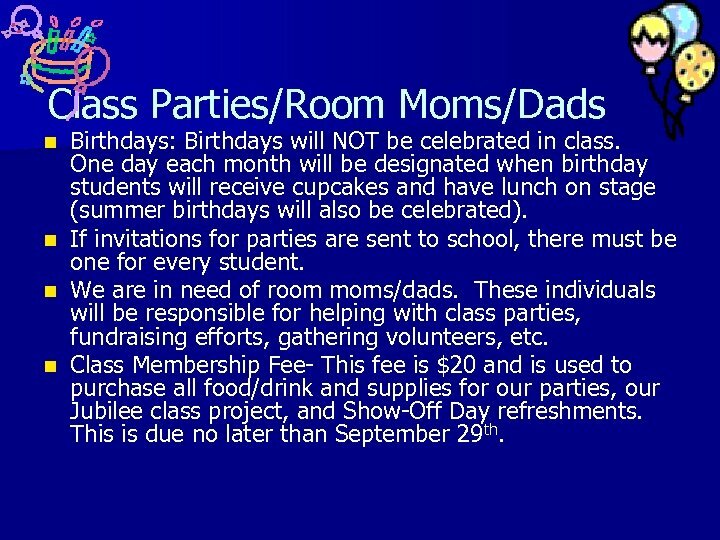 Rewards: n Classroom incentives: May include stickers, stamps, extra center time, treasure chest, etc. n Weekly classroom reward: Students receiving at least 4 green dots in a week will get to skip nap on Friday for a special treat. n Monthly PBIS reward: Students earning green or silver dots at least 75% of the month will earn the privilege of participating in a special PBIS activity. 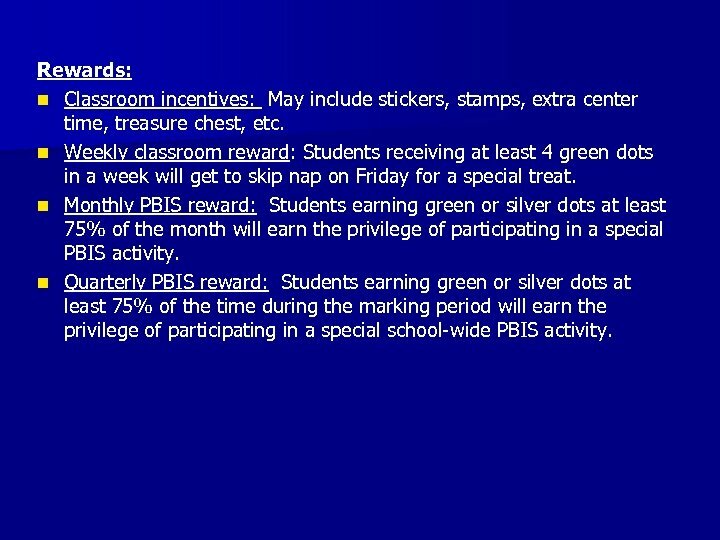 n Quarterly PBIS reward: Students earning green or silver dots at least 75% of the time during the marking period will earn the privilege of participating in a special school-wide PBIS activity. n Monthly PBIS activity: Any student failing to earn at least 75% green/silver dots during the month will serve detention during the monthly PBIS activity. A PBIS detention form will be sent home the day the detention is served. The form must be signed and returned. 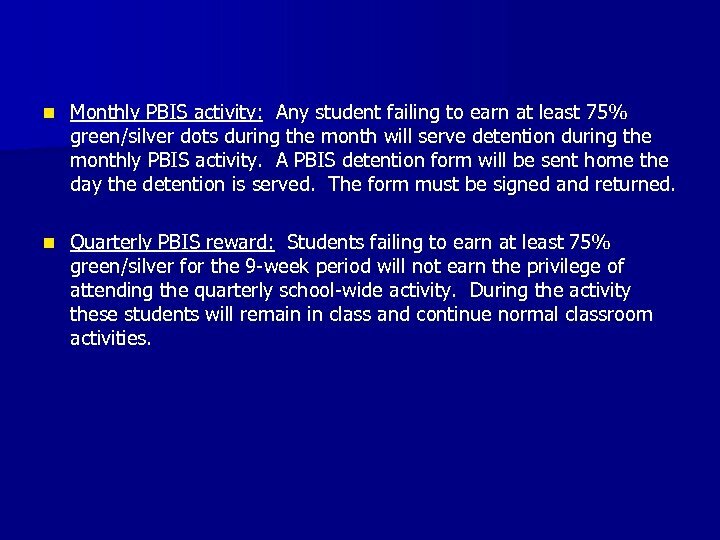 n Quarterly PBIS reward: Students failing to earn at least 75% green/silver for the 9 -week period will not earn the privilege of attending the quarterly school-wide activity. During the activity these students will remain in class and continue normal classroom activities. We hope you enjoy your year with us!! 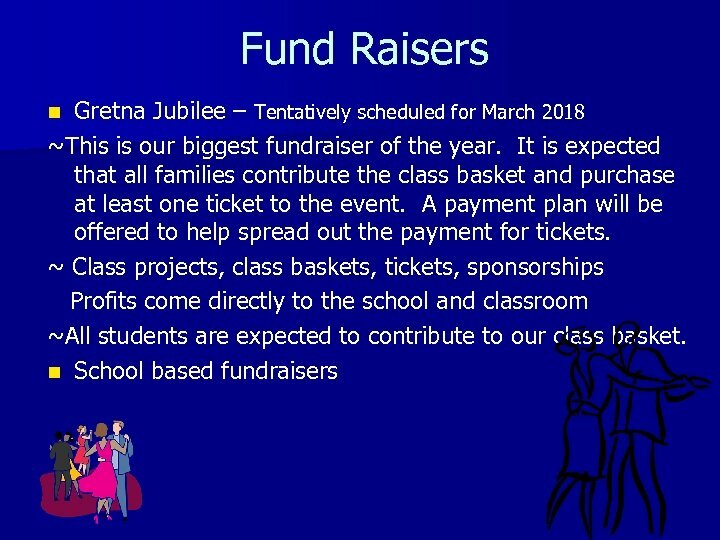 n n n Please feel free to contact us at school by calling the school office at 347 -4739 or you email us at the following email addresses: Darlene Le. Blanc ~ darlene. [email protected] k 12. la. us Misty Ohmer Grantham~ misty. [email protected] k 12. la. 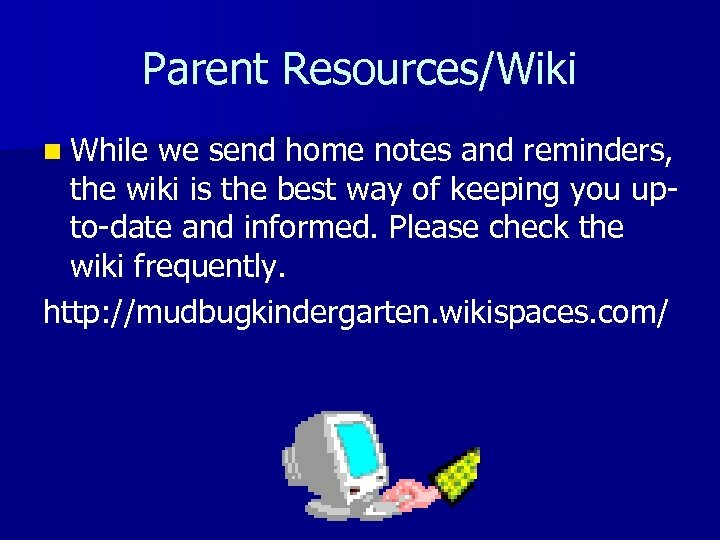 us We will also check our class WIKIs for questions. 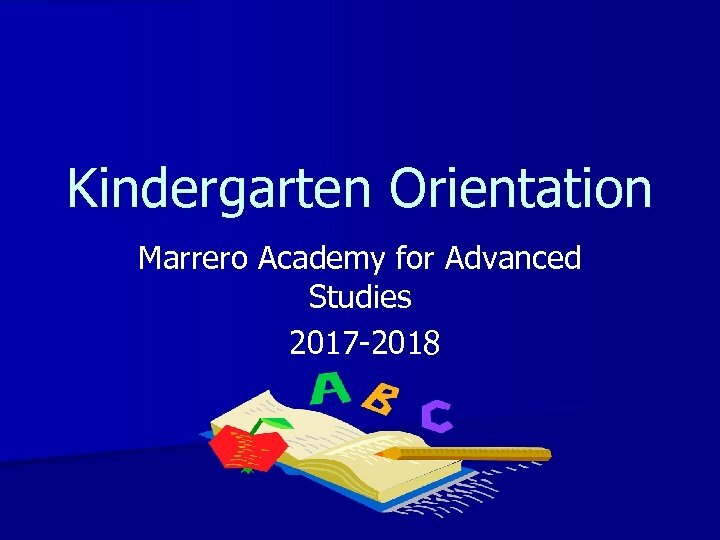 The WIKI address is http: //marreroacademy. wikispaces. 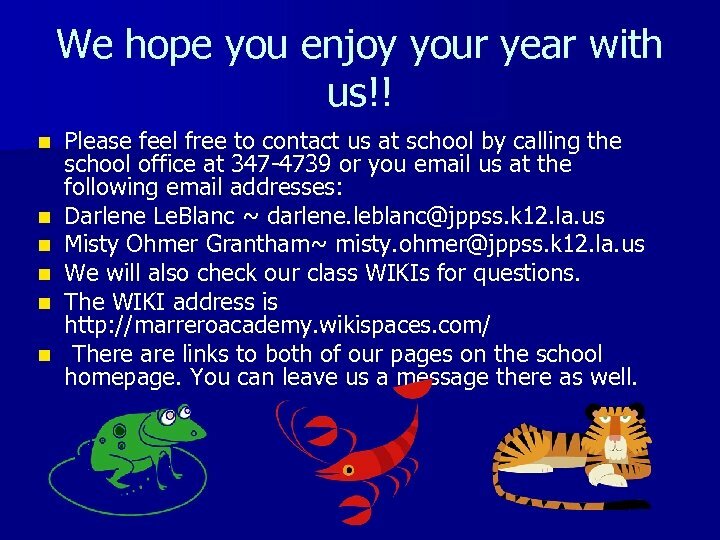 com/ There are links to both of our pages on the school homepage. You can leave us a message there as well.